All other competition related questions or comments about recipes, techniques, and related topics. 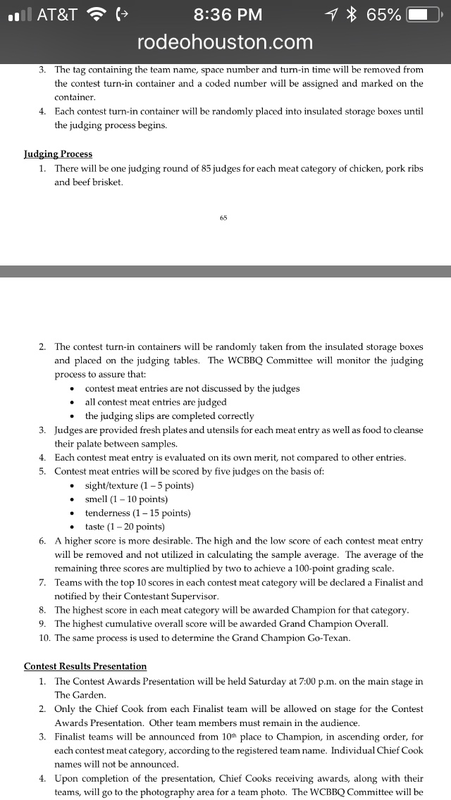 Does anyone have experience that could share on the process of judging for the HLSR WCBBQ with the 2018 new rules of submission of each meat per team vs per spot? Eg IBCA uses a utensil to pick at meat or get tiny slices because so much to eat ... what is WCBBQ judging like? I don't know about HLSR WCBBQ, but there are some members here that Judge quite often; maybe they will see your post and have something helpful for you. The HLSR cookoff is run entirely by them. They have no affiliation with any sactioning body. They do recognize the winners of the other big 3 cookoffs and give the winners a spot each year. But the judgeing is run entirely in house. Go to page 62-65 of this link and see if it answers any of your questions. GRailsback wrote: Go to page 62-65 of this link and see if it answers any of your questions. Yes it’s helpful but doesn’t exactly states what really happens and the process when sitting down to judge.